People find this place rather nice! Average score: 5.9 by 572 random voters. This cathedral is an exemple of Brabantian gothic from the late gothic. In fact, is was built around a romanesque church dating from 1124. This declares the irregular plan, certainly compared to other gothic churches. The building of the gothic church started in 1352. It took 170 years to finish the building in its current shape. The romanesque church was destroyed in 1487. 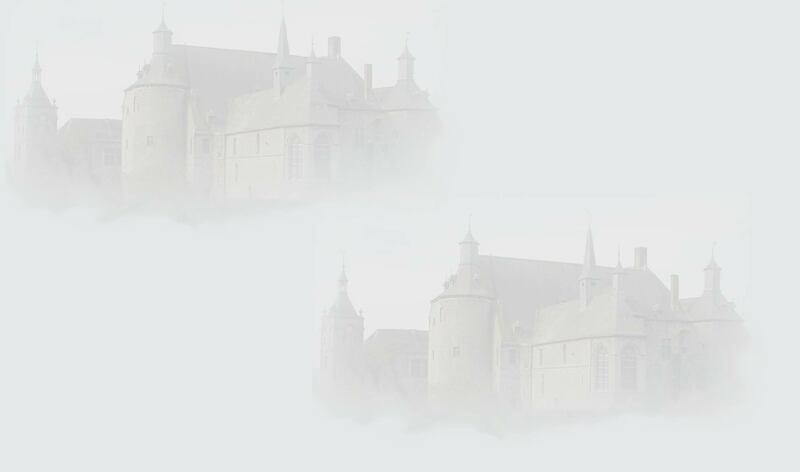 As architects for the largest cathedral in the Benelux we name Jacob van Thienen, Peter Appelmans, Jan Tac, Everard van Veeweyden and the families de Waghemakere and Keldermans. The central aisle and the choir vault were constructed around 1391. The interious is an exceptional large space, consisting of no less than 7 aisles supprted by 48 great clustered columns. Above the arcades in the central nave, we see a pseudotriforium, in fact reduced to a parapet. In 1420, the construction of the left tower started. The tower now reaches 123 m (the highest in the Low Lands in its time). 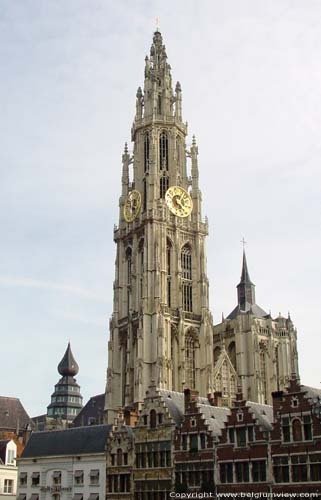 It had a duible function: in fact, it served as belfry and was paid by the city of Antwerp. Still today, the city owns it. Hence, from time to time, you notice flags on it, hihgly unusual for church-towers. The right tower, that was meant to be the real chruch tower, even had to be higher. The construction started in 1430, but it never was finished. The main porch was crowned by a beautiful wimperg. Because this church was built on wet grounds, out of the city, a lot of attention was given to the foundations. It is said, that the architect used cow-skins under it. The emperor Charles even thought to enlargen the building. In 1521, he laid the first stone for this, according to plans by Rombout Keldermans and Domien de Waghemakere. This is still visible when looking at the streats on the east-side. A heavy fire in 1533 stopped those plans from being executed. Also the interious was seriously damaged then. Few years later, the church got elected to bisschop's seat (katheder) for the (then new) diocese of Antwerp. Hence its title of 'cathedral'. The icinoclastic furies of 1566 and 1581 lead to a lot of damage. During the French government (Napoleon), the church plundered. Town building master J.Blom succeeded in delaying plans to demolish the catherdral, so it survided the French period. During the 19 century, it was refurnished. Old furnishment was bought from other relegious buildings, and new, neoclassicistic and neogothic was ordered. The choir by F.Durlet, as well as several side altars and inner halls. The magnificent pulpit dates from 1713 and is made by M. van der Voort Sr. It shows the Christian message to the 4 parts of the world. The main altar dates from 1824, and was made by J.Blom. The Saint- Antonius altar dates from the 17th century, and houses a statue by Arthus Quellin. The Our-Ladies altar was made in 1678 by Arthus Quellin the Younger and Pieter Verbruggen. There are 17th century confessionals by Willem Kerricx, M.van der Voort and L.Willemsen. The organ-case dates from 1567, and was adapted by Pieter Verbruggen in 1657. The organ itself is made by P.Schyven. The are interesting grave-stones, like the one for Isabella of Bourbon (died in 1465) with a brass lying statue of her. This comes from the Sint- Michielsabbey in Antwerp. The grave-stone for bishop A.Capello from 1676 was made by door Arthus Quellin the Younger in 1676. The cathedral is world-famous for its paintings. You find Pieter Paul Rubens' 'cross-hanging' and 'taking off the cross'. But there are ofcourse also paintings by less famous masters, like 'Crying for Jesus' en 'Wedding in Cana' by M. de Vos, 'Jesus' 15 bleedings' en 'Jesus with the scribers' by Frans Francken, 'Taking off the cross' by A. van Noort (ende 16th century) . Since 1961, an important restauration was started.